After nearly ten years in print my “Modern Switzerland: A Volume in the Comparative Societies Series” (McGraw-Hill 1998) has been pulled off the shelves. At the time, I wrote this booklet to help introduce undergraduate, primarily sociology students from the US to my native country and, frankly, also as a self-therapy for my homesickness. The concluding chapter takes the reader on a metaphorical train journey from Geneva in the far west of the country to St.Gallen, my home town, in the east. Physically, I had traveled the width and breadth of Switzerland by train numerous times, including all the segments between the cosmopolitan Geneva and the more provincial St.Gallen. 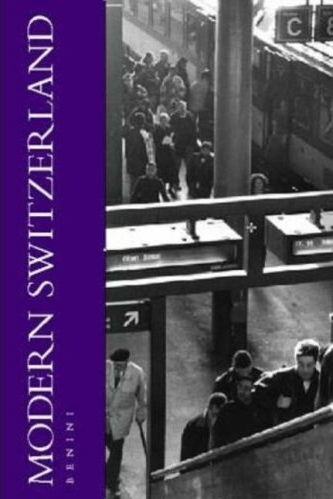 Symbolically, and regardless of the high mobility by other means of transport as well, the railroad is such a central element of Swiss culture that the panorama of a train ride astride one of the country’s main diagonals seemed an appropriate backdrop to the book’s summary. Below comes the original text, composed in 1997, augmented with more recent images, some by my friend Matthias Wehrlin, who also provided the cover photo for the book. Captions are mine, 2007. The West East intercity express train leaves Geneva one minute to every hour, sixteen times a day. It paves its way between the Lake and the United Nations into open country, greets the French Alps to its right, vineyards on the slopes of the Jura to the left. In Lausanne, passengers to Italy may transboard; the express swings up the grade into the Midlands. We leave the Protestantism of Calvin and the cosmopolitan feeling of the western corner; the countryside has a more earthen quality and while still French-speaking, for a while is solidly Catholic territory. Shortly after Fribourg, shooting over the Saane river, we delve into Alemannic Switzerland. One hour and three quarters after the journey began, Berne, the capital beckons her welcome. On the opposite platform waits a train to Germany to the north. Flying eastward, however, the express does not bother about the numerous industrial towns any more than about farms, orchards and forests till it reaches Zurich, center of commerce and hub to distant continents. Zurich is hectic, but after the airport, the pace slows down by stops at lesser towns. The train gently climbs, comes in closer view of the Alps, though never near their feet. Four and a half hours into its journey, it ends in St.Gallen, with the German and Austrian shores glimmering from the far side of Lake Constance. 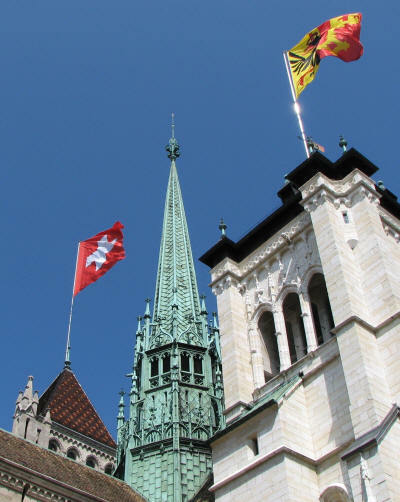 At the starting point of our journey, the national and cantonal flags flown above the Geneva cathedral almost make us forget how deeply international this city has been for a long time, since the Reformation era, the League of Nations, and the International Red Cross. Sociologists could, of course, populate the train with members of the groups that frequent certain stations more than others. Thus, we would expect to find more federal employees travelling between, say, Berne and neighboring Fribourg, than between Zurich and St.Gallen. And, during the month of October, farmers in traditional garb would congregate to St.Gallen, on their way to the national agricultural fair. Such insights would be legion, and most would be trivial. What this book has attempted to show is the massive contrasts in historic places, current status and future prospects that the train lets us visit over the entire spread of a country within less than half a day. From the global debates at the United Nations to the cattle prizes of the fair, the train connection is largely metaphorical; the two sets of participants do not often intermingle. But for most other events, the connection is real, close, massive. Trains move many sorts of people, not only the expected ones to the expected places, but also those to be brought into conviviality from opposite and indifferent ends. Picturebook Switzerland: A full moon rises over the Alps as the evening glow lights up fields near Wünnewil, Fribourg, a region that treats travelers to largely intact rural sceneries. For over a year, I commuted between Berne and Geneva, enjoying early morning naps, coffee and croissants, reading and conversations with strangers, and the beauty of landscapes so variable during the two-hour trip. For a while, I was able to predict when exactly to look up from my book to spot the same family of foxes playing with their young at a particular forest rim. As with any powerful icon, the line between metaphor and physics, between ideal and grudging reality is thin. Swiss trains are parentheses that hold together an unlikely diversity of groups and cultures. The mixing stays incomplete; apart from the trains and the railway stations, the communities continue their own business, different lifestyles, and mutual ignorance. But thanks to the trains, peace, sweet commerce, friendly visits also abound. The picture in the picture: Just a short distance further on, behind the tangled trolley bus wires of Berne central station, the same rural imagery carries a postmodern irony. Playing on the paradox of a globalizing world "Go far. Come close", this commercial has an iconic Swiss cattle procession meet a camel caravan, a mainstay from the orientalists' panoply. Are the two headed for a collision, a peaceful encounter, or even a merger? We are left to wonder, but the tension that it expresses is keenly present between real-life Swiss and many immigrants. Can this idyllic version of a small country go on? For prognostications using the train metaphor, we would need more solid traffic statistics. But it seems that pressures are mounting against the trains. The international jet set descending on Geneva may be growing faster than those who arrive by the East West express. In Berne, a capital without a proper airport, more people may actually be using trains, but do as many of them travel beyond their dormitory towns and beyond Zurich international airport? In Zurich, we are certain, those who no longer can afford intercity trips at discretion have become more numerous, and so have the ones who travel by car because it is more individualistic. And will the farmers around St.Gallen really care if fewer trains connect them with Geneva, or will they prefer more generous local bus services? If the fiscal crisis of the state obliges to reduce the number of trains, how many will be the minimum in order to hold the country together? 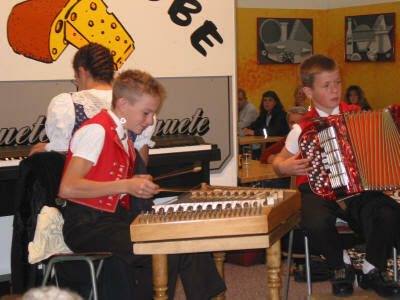 The accordion and hackbrett-playing boys to whom I listened at the agricultural fair in my home town may be part of that Switzerland which others have called "saturated with ancient values". But the cultural scene, rich and pulsating also outside major cities, has been surprisingly capable of experimentation and symbiosis with foreign sources and partners. Since I wrote this book, I have grown cautiously optimistic about Switzerland's ability to adapt, innovate and contribute. A strong economy has helped; many problems recede simply because the wealth is there to pay for their mitigation or at least postponement. And there may be historic fortune at play, perhaps the right measure of internal diversity matched to the right levels of turbulence from outside. Who knows? Anyway, the author must not rest! No sooner had the book come out, telling readers that "the West - East intercity express train leaves Geneva one minute to every hour, sixteen times a day" than I missed it, unprepared that schedules had been changed meanwhile. They keep changing them. Time to board again ..